The first retro action figure line based on the works of H.P. Lovecraft! Cthulhu-themed figures based on figures of the late 1970s and early 1980s. Articulated 3 3/4-inch action figures include character-specific accessories. The Deep One, The Cultist, Spawn of Cthulhu, Professor! Case contains 12 individually packaged action figures. 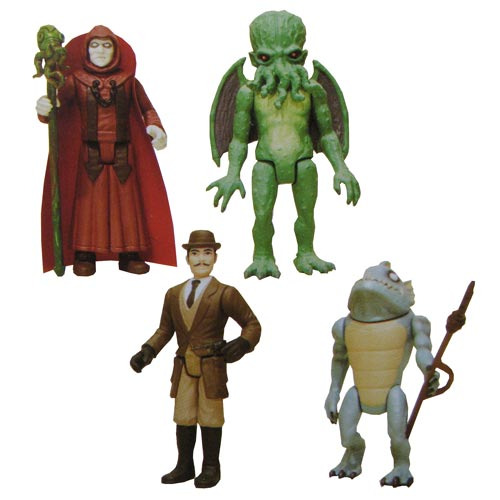 Legends of Cthulhu is a 3 3/4-inch action figure line based on similar figures of the late 1970s and early 1980s. It's the first retro action figure line based on the works of H.P. Lovecraft! Great care was taken to design these figures in a way that's true to the time period, with appropriate articulation, awesome character-specific accessories, and deco consistent with the era. Each figure comes in blister-card packaging. Ages 15 and up. The figures in this first wave are based on classic archetypes that include Deep One, Cultist, Spawn of Cthulhu, and Professor.